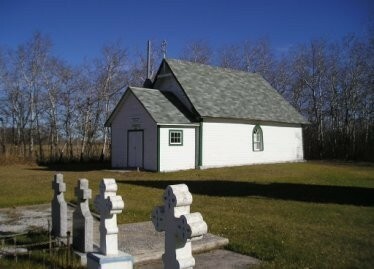 The Church is located in Gorlitz, SK, 15 miles north and 2 miles west of Yorkton. In the early 1900’s immigrants arrived from the Bukovina area of Ukraine to settle in the local area. Holding on to their Orthodox faith, the settlers gathered together to worship together and started the work underway to build the church. The parish was initially served from the Monastery in Burgis, SK. The original building still stands on the property. The Church, along with a separate bell tower and graveyard with app. 50 graves is located in the middle of a tree area that is now a community pasture. Only one family lives near the church. The building and graveyard are well maintained.